Juan Martinez, community leader of ASOTRACAMPO, of the El Tamarindo community, has this evening recieved death threats to his personal cell phone. The message also threatened Colombian activists who have accompanied ASOTRACAMPO. Please send an email to the [American Embassy in Bogota], or the [Colombian Embassy in Washington] to express your concern. A text you can use is at the bottom of this post. ASOTRACAMPO have faced numerous threats and daily harrasment for standing up for their rights to equitable and fair treatment while they live on El Mirador. El Mirador is the last of 4 plots on the El Tamarindo land – the people living on the previous three have all been forcebly displaced. The community of El Mirador, recently declared a “Refuge of Peace and Hope”, is made up of campesinos violently displaced from other parts of Colombia. There has been 2 deaths in the last year. 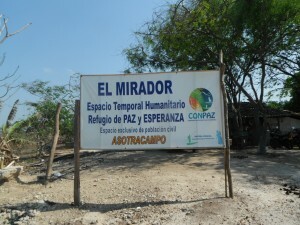 For more information on El Tamarindo please see: https://nacla.org/blog/2014/3/24/displaced-and-duty-free-el-tamarindo-colombia. Hace unos días, un investigador de FOR, John Lindsay Poland, presentó en Washington, DC un informe en el tema de las ejecuciones extrajudiciales – los mal llamados “falsos positivos” – y el entrenamiento militar y apoyo financiero que ha recibido el Ejército Nacional de Colombia por parte de los Estados Unidos. Este estudio utiliza una metodología para evaluar el impacto que tiene este apoyo de los Estados Unidos sobre los derechos humanos, al mirar en profundidad a un grupo surtido de violaciones de derechos humanos cometidas por las fuerzas armadas colombianas. Se trata de comprender qué papel jugó, si alguno, la asistencia de seguridad de Estados Unidos en el aumento o la disminución de encargos de asesinatos – de ejecuciones extrajudiciales por parte del ejército de Colombia entre el 2000 y el 2010. Presentamos un resumen de este informe en español y más abajo sigue un enlace al informe completo en inglés. 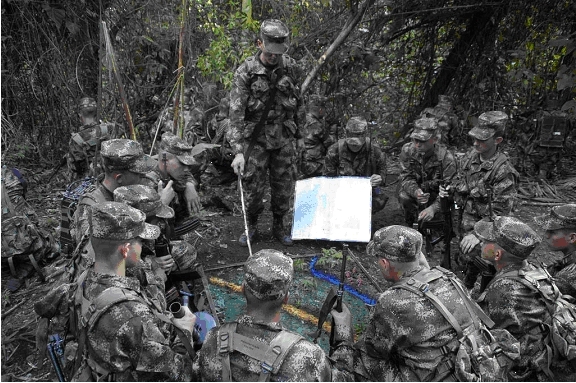 Our partner John Lindsay Poland has been working on a ground breaking work looking into the relationship between levels of US aid to Colombia, one of the highest recipients of US military aid and training in the world, and the incidence one of the most grievous forms of human rights abuse, extrajudicial executions. The report utilizes statistical analysis, as well as in depth and wide-ranging interviews with both the military and the civilian population that was subjected to this abuse. The report was last week presented to an audience in Washington, and the Spanish language report will be officially launched in book form on the 3rd June in Bogotá. Below is the executive summary in English, followed by a link to the full report.